Retail establishments often get celebrity endorsers to promote their products. Krispy Kreme’s recent choice is an international celebrity that the young and old couldn’t resist – Mickey Mouse. This charming mouse got us to make an unscheduled stop at the Krispy Kreme Gateway Mall branch simply because my niece and her mom spied upon their Mickey Mouse Doughnuts signage from the car window. We’ve always been fond of Krispy Kreme so there were no objections in making the stop. However, everybody wants to pick their own Mickey Mouse doughnut so we all ended up going inside the store. We were tempted to buy one of each Mickey doughnut flavors but since we were also watching our waistlines we decided on getting one flavor each. 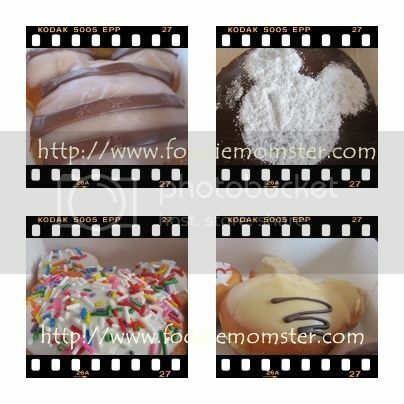 Our picks included the Chocolate Iced Kreme Filled, Nuttela, Peanut Butter & Kreme, and Vanilla Candy Sprinkle. We also got the same flavors for everybody else in the house. Except for the Mickey Mouse shape of the doughnut they were still the same Krispy Kreme doughnuts that we have come to love. But the kids loved them more, and were asking for more, simply because it is Mickey!